The Tung-sol reissue valves are produced by the Sovtek Corporation to high standards at their reflector plant in Russia. These are recreations of some of the most popular Audio and guitar valves and they also produce some original designs under the Tung-Sol name such as the KT120. These valve are used by original equipment manufactures the work over for their sound quality and reliability. The KT150 is a totally new design intended for high end audio use. 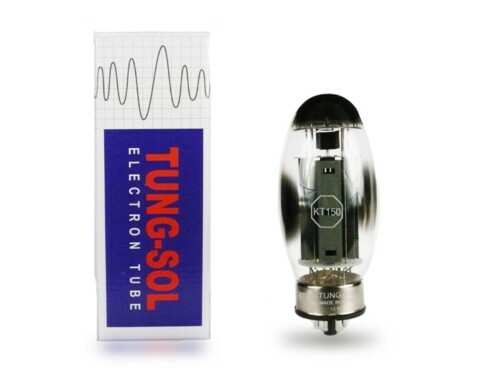 The Tung-Sol KT150 is the most powerful octal beam tetrode ever produced. It has a plate dissipation of 70 watts and so a pair of KT150s can allow an amplifier with a power output approaching 280 watts to be built. After the introduction of the highly successful Tung-Sol KT120, Russias premier vacuum tube inventors set to work to develop an even more powerful audio output valve. The market reaction to this valve has been overwhelming, the praise that this valve has received leaves me in not bought this will be used in designs of the future. Comments have ranged from the huge dynamic power and depth of the soundstage. The bass is fast and tight with a warm and neutral midrange. The top end is both transparent with excellent clarity. Before buying these you will need to contact your equipment manufacturer to clarify that your amplifiers power supply is capable of running this valve as it uses 2 amps of filament current. The valve is also very large as you will need least 6-1/2" of space from top of the amplifiers valve socket to the amplifier lid. The valve must be easy to install and must have enough space to cool down after use. The valve measures around 5-1/2" from bottom of base, excluding the pins to the top of the glass. So if you are thinking of installing these you will need to get the advice of both the manufacture and a professional technician before you install these.